No Social Networks For A Week? Technology is certainly something else. It seems like each generation has some sort of technology that changed the world as we know it. Items like … televisions, the automobiles, the personal computer, iPods, cell phones, and the latest craze of social networking. With advancements in technology comes a strong dependency on them as well. As humans we often beg the question of what did we do before (insert piece of technology)? or how did we survive without (insert piece of technology)? We are all guilty of it. Just like we are all guilty of challenging someone to go without (insert piece of technology) for an extended period of time. Well one university decided to challenge and experiment with its student body and faculty. The Harrisburg University of Science and Technology decided they were going to black out access to all forms of social networking on their campus for one week. According to the Yahoo! article written by the Associated Press, many students have been ok with the experiment. Of course the students would be ok with it at Harrisburg University of Science and Technology. You try this mess at University of Central Florida, Ohio State, Arizona State, Wisconsin or any other big schools in the country and it would be so ON! Bad enough they took Napster away from us. You saw the outrage when that went down. Imagine the chaos if you said to a student they couldn’t log into their Facebook account. Man oh man! You Are Going to Harrisburg University of Science and Technology whether you like it or not! So this brings up many questions or topics to debate. 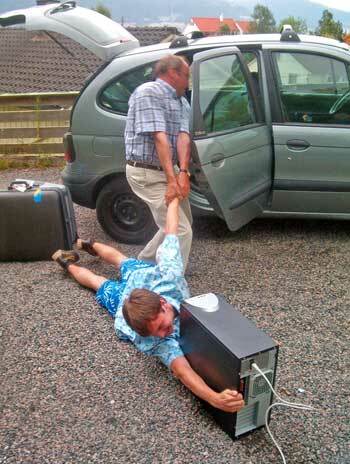 Do you think you could last a week without social networking? Could this experiment be the start of college’s regulating access to social media? Do you even give a damn about this post? Please provide all answers in the form of a comment. I would love to hear your thoughts! I know that I couldn’t live without MySpace for a week. That is for damn sure. You can take my eyes but not MySpace! Ha-ha!